I’ve been studying plot structure for a while. Recently, I found myself wanting to play Final Fantasy XII again. Your chocolate is in my peanut butter. FFXII features highly-memorable characters and settings, and one of the most difficult and complex plots of any game I’ve played. After reading the plot structure defined by Larry Brooks in his book Story Engineering, I decided to see how well this epic matched with it. A game doesn’t need story structure, right? The only thing that matters is the interactivity, the bad-assed battles, the crazy magic explosions? After a few hours of replaying this masterpiece, I found myself picking out plot points. A structure does indeed exist in this byzantine plot, and it is worth examining for people interested in how sweeping, history-altering stories are constructed. Prologue: The game starts with the fall of a small country to an expanding empire. We see the prince die in battle and witness the murder the king by one of his trusted captains. We hear of the death of the princess, leaving the ruling family extinct. At this point, the stage is set and we’re already hooked. We’re invested in this small country’s plight, and want to see the king’s murderer brought to justice. Opening section: In the occupied country, we meet an orphan boy named Vaan who is making his way on the city streets with wit and bravery. We learn that Vaan’s older brother was present – and murdered – at the death of the king, and that Vaan detests the empire and those involved in the treason. Various adventures put Vaan in possession of an important artifact (the magicite stone) and involve him with the characters who will make up the party throughout the game, each of which have their own motivations and stakes. We learn that the princess is still alive, and working with a resistance force. This is all set-up. There are plenty of fights and exciting scenes and all, but each of these sets up the first plot point, which comes in roughly one quarter of the way through the story. First Plot Point: Captured by the empire, the princess allows the magicite stone, the only existing proof of her identity and royalty, to be given to the enemy in order to save the lives of the party. The baddies try to use the stone, and end up destroying themselves in a gigantic explosion, revealing that magicite is the ultimate weapon. This event kicks off the rest of the story. The princess Ashe is on the run with little hope of reclaiming her throne without her magic stone, but armed with the knowledge that it can be used as a weapon. There is an oddity in the structure here. Vaan, the scrappy teenage blond who serves as the archetypal lead in Final Fantasy stories, has been the story’s protagonist until this point, but from here on out it is Ashe who drives the plot. Vaan serves as comic relief, or at best a roguish friend to Ashe, who must battle with her personal desire for revenge and the responsibilities as a leader. In this section we see the protagonist trying to solve problems the same old way. This never works. Pinch point 1: Brooks highlights pinch points in a novel, places where we see the baddies closing in despite the protagonist’s efforts. We have one about two-thirds of the way through the second section in which we see the leaders of the empire quarreling and cooler heads failing to prevail. Things are gonna get worse before they get better. 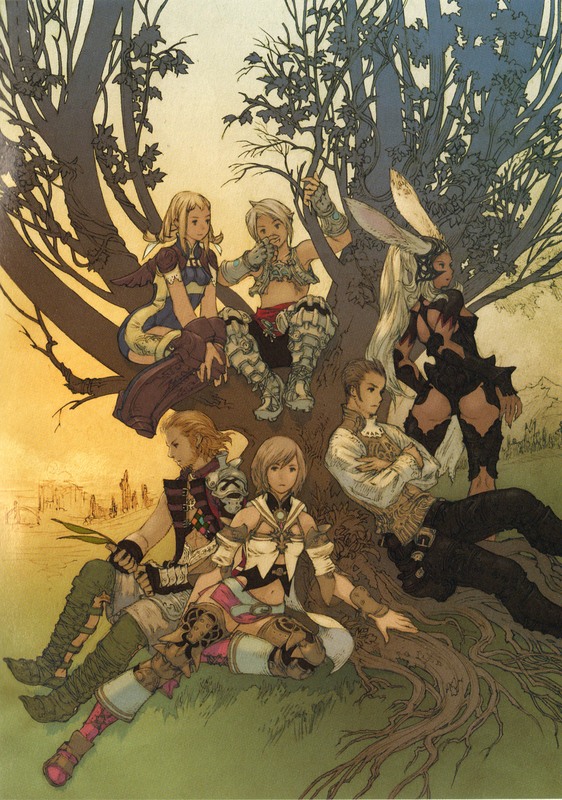 FFXII handles exposition and important plot points in an unusual way for games – a paragraph read from an historical text. One of the non-playable characters keeps a journal of the events of the time-period, and quotes from his journal appear at certain points in the plot as milestones. One of these interludes takes place here, at the first pinch point. Midpoint: Ashe is presented with a new option – ally with another great empire. They will acknowledge her rightful place on the throne, and the baddie empire will have to back off to avoid a very big war. She decides to go for it. Then she gets a sword which can destroy magicite. Because, you know. This is a Final Fantasy game after all. Enough with the reacting; it’s time to take the reins and make some stuff happen on my (the protagonist’s) own. Ashe wants blood, and the magicite is a way to get it. But she puts her own emotions aside to sue for peace and quite literally takes up the sword to destroy the magicite (a.k.a. ‘the nuclear option’). Third section: Action Jackson. From this point forward, it can officially be considered on. Ashe has the magic sword which can cleave the magic stone, removing the nuclear option from both sides of the conflict. The baddies, of course, are well on their way to getting their hands on the mother lode. The race, and the requisite thrilling heroics, is now in full swing. Still, Ashe isn’t quite sure if she can resist using some of the stone to killify large numbers of imperials and take revenge for her father, her husband, and her country. The internal conflict continues. Pinch point 2: Another journal entry, and then a cut-scene depicting the resistance forces training for battle. This war is coming, people, no matter what the princess and her magic sword have planned. Hide your kids. Second Plot Point: Oh man. It turns out that the magicite was placed on ‘earth’ by gods. Our heroes meet these gods, who tell Ashe to use the sword not to destroy the mother lode, but rather to scrape off a few shards to use to install herself as Queen. Ashe now has divine authority telling her to choose revenge. The second plot point is the last place in the narrative where information can be revealed. The secret of the magicite’s power is now known – all that’s left is to do something about it. Fourth section: Resolution. Ashe decides to ignore the gods and end the age of stones. She and her stalwart band of misfits face the Big Bad and end the war before it starts. Ashe becomes Queen, and all is right with the world. After the second plot point, there’s nothing left to do but get the thing done. The music rises, demons are faced, and the plot is over. What this outline does not present is the multiple sub-plots, the intricacies of the political maneuvering behind the scenes, the other important characters, the set-piece fights, etc. This is the story of Ashe, her fight for the freedom of her country, and her personal struggle with grief and revenge. Antagonists, friends, tentative allies, traitors, and all manner of other people weave their ways into and out of the story, but at its core this is the tale of one person and her journey. The overarching structure allows for these interesting and enjoyable sub-plots while keeping the main story moving on its way toward resolution. This entry was posted in Uncategorized and tagged featured, final fantasy, plot structure on September 11, 2011 by gala5931.